SS1 Pierbach 1 (18.99 km) 19:01.4 35. 14. ERC 59.9 11.00 19:01.4 35. "I spun 3 time" / "3x jsem byl v hodinách." SS2 Liebenau 1 (10.22 km) 10:12.0 56. 24. ERC 60.1 18.12 29:13.4 43. SS3 St. Oswald 1 (8.30 km) 6:18.5 20. 9. ERC 78.9 7.45 35:31.9 40. SS4 Pierbach 2 (18.99 km) 17:09.1 14. 9. ERC 66.4 5.65 52:41.0 32. "We had a small spin. Conditions were much better than this morning, not having to clean the road. Okay, small mistake, but doesn't matter, you have to learn to get the experience." / "Zase jsme udělali menší chybu, musíme se učit." SS5 Liebenau 2 (10.22 km) 8:16.9 11. 6. ERC 74.0 5.62 1:00:57.9 29. "The stage is a bit cleaner, but it's been snowing a lot and we had to do a lot of road cleaning. This weather is only good for rallying!" SS6 St. Oswald 2 (8.30 km) 6:16.0 15. 8. ERC 79.5 6.34 1:07:13.9 25. SS7 Pregarten 1 (8.76 km) 6:37.3 19. 9. ERC 79.4 7.19 1:13:51.2 23. "Still tricky. It’s a shame I spun 2 times. We lost 30 seconds on Lefebvre. Let’s see 2nd loop in the night." SS8 Schönau - St. Leonhard 1 (22.93 km) 20:18.3 11. 5. ERC 67.8 7.54 1:34:09.5 16. SS9 Pregarten 2 (8.76 km) 6:17.1 11. 7. ERC 83.6 4.76 1:40:26.6 16. SS10 Schönau - St. Leonhard 2 (22.93 km) 19:52.4 10. 7. ERC 69.2 5.87 2:00:19.0 15. "Really long stage, it is much better. It is he first stage I do completely on the night in a rally. I did not do any mistake so that is good. The target for tomorrow is to finish the rally." / "Opravdu dlouhá zkouška, je to mnohem lepší. První zkouška, kterou jsem v noci dal celou. Neudělal jsem žádnou chybu, a to je dobré. 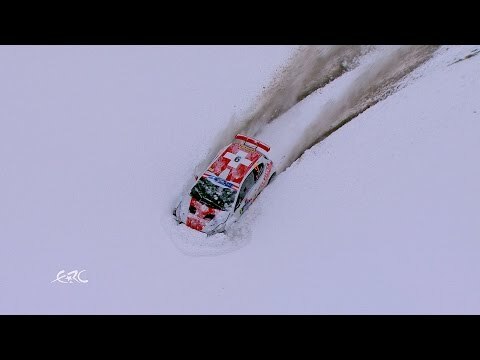 Cíl pro zítřek je dokončit rally." SS11 Gutau 1 (8.27 km) 6:49.7 25. 12. ERC 72.7 8.34 2:07:08.7 16. "The day starts pretty good, no mistake. With a new set of tyres good grip. Let's see if I improve. I want to finish the rally and want to push a little bit more. Maybe we will surprise, not only for me but also for the rally." / "Den začal velmi dobře, neuělali jsme žádnou chybu. S novou sadou pneu máme dobrou přilnavost, uvidíme, jestli se zlepším. Chci dokončit rally a trochu víc tlačit. Možná budeme překapeni." SS12 Unterweissenbach 1 (12.54 km) 11:22.2 32. 16. ERC 66.2 9.85 2:18:30.9 16. SS13 Arena Königswiesen 1 (7.79 km) 7:13.3 21. 8. ERC 64.7 7.45 2:25:44.2 16. SS14 Gutau 2 (8.27 km) 6:04.3 13. 9. ERC 81.7 5.07 2:31:48.5 16. SS15 Unterweissenbach 2 (12.54 km) 10:04.7 12. 9. ERC 74.7 6.17 2:41:53.2 15. SS16 Arena Königswiesen 2 (7.79 km) 6:30.4 12. 9. ERC 71.8 5.39 2:48:23.6 15. SS17 Bad Zell - Tragwein - Aisttal 1 (21.10 km) 15:23.8 15. 10. ERC 82.2 5.24 3:03:47.4 15. SS18 Bad Zell - Tragwein - Aisttal 2 (21.10 km) 14:32.1 7. 6. ERC 87.1 2.75 3:18:19.5 12.